Life is funny. So laugh. Lately I’ve been reminiscing about all of the stupid things that happen to me. I’m not sure if it’s bad luck, or I’m just going through life waaaaayyyyy too fast. Most recently I’ve been walking around with a nasty bruise on my arm. Looks as if somebody beat me. But when people ask what happened, I feel obligated to tell the truth — although telling them somebody beat me wouldn’t be as embarrassing. Well, I ran down the steps in the morning, slipped in a puddle of my dog’s pee and hit my arm on the railing. Then, I fell backwards, landing on my back in the small lake I call “CosmoKantHoldit” and yes, I cried. The pain, the smell, the drenched clothes….this is my life. Sometimes things just happen, and I don’t really have any control. For instance, last year I got a birdie in golf. No, I literally “got a birdie” in golf. It was taking off, and my ball clobbered it. And other times I need to pay more attention. Like when I reached for a delicious Twizzler and accidentally grabbed my red Bic pen. And no, I didn’t eat it. I know plastic when I taste it. Then there was the time I was leaving work, walking to my car and drinking a bottle of water. I bent over to rummage through my purse looking for my keys and poured the whole bottle of water into the bag. Now, that was a dumb blonde move for sure. However, I must say, the best one was when my friends and I were heading home from Boston and we took a break at a rest stop. I was a little hungry and decided to get something healthy, instead of a greasy burger. 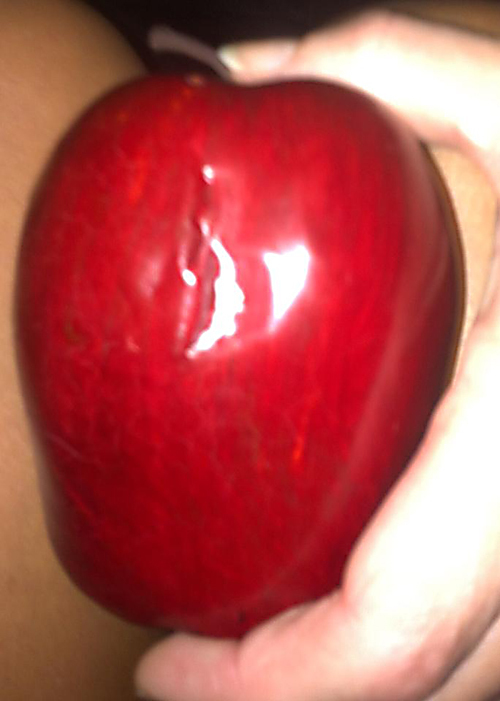 So, I grabbed an apple out of a barrel in one of the shops, and was all proud of myself for eating right. When I got into the car and took a bite I realized it was styrofoam (see my little bite mark?). No wonder it seemed like it wasn’t the right weight for a delicious piece of fruit. Now tell me this…why, oh why, would you have a huge display of fake apples? …and let me buy one?! SEE? THIS IS WHY WE SHOULD EAT BIG MACS! There are so many more — but this is definitely enough sharing for tonight.